Ian's inspiration behind writing writing Endure. How Ian dealt with the disappointment of making the Olympic team, but not actually getting the chance to run and compete. Why Ian used his story and the stories of other athletes in his book. 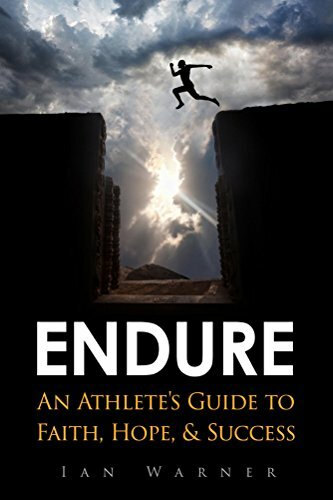 How athletes can use the idea of endurance to their benefit. Ian explains what faith means to him and what can it look like. How we are all a part of a bigger picture and how to embrace this mindset. What it was like for Ian to grow up with an older brother who was also an elite track athlete. Why dreams are often associated with the gifts you are given. What Ian was doing to blaze his own trail from an early age. Why its easier now then ever before to make an impact in the world. How to use your roll-over minutes as an athlete (translatable skills). Why you miss 100% of the shots you never take still applies. How to stay hungry after accomplishing a goal. The importance of focusing on the process and self-improvement in the absence of extrinsic motivators. Why we should overcome evil with good. How to learn from your physical and mental pain as an athlete. The L4-L5 back injury struggles Ian had and the little changes he made to alleviate his debilitating pain. Why most athletes are overtraining and the importance of recovery. When is enough, enough? - And living to fight another day. Ego and pride’s role in athletics, the good, the bad and the ugly. The athlete identity and how social media is reinforcing the brand. Ian talks about a friend he lost to suicide after their track career ended – CTE discussion. Why you shouldn't wait until the very end to find an identity outside of your sport. Football injuries Ian experienced from growing up including a spiral fracture of his tibia. Why he stopped playing football his Junior year of high school. How Ian's personal struggle to find adequate medical advice and treatment led to the creation of KHO Health. How Ian works to keep his body injury free today. Why athletes should surround themselves with the right team of medical expertise, but also know how to take care of themselves. Why you shouldn't wait until you are broken to seek help. Are there circumstances where it is okay to push it? The cumulative affects of dropping the ego and its correlation to career longevity. How athletes can use KHO Health to prevent and recover from injuries. where can you get your own copy of endure? WHERE CAN YOU Connect with Ian? Where can you find KHO Labs? This week on the Heads 'N Tales podcast I interview Liam Mulcahy who is on the board at Good Grief, which is a New Jersey based organization that offers free bereavement services to families coping with the loss of a family member. Good Grief provides FREE support to children, teens, and young adults after the death of a mom, dad, brother, or sister. Their programs help participants develop the coping skills they need now and for the future. Peer-support is highly effective because children and families learn they are not alone, learn from those going through something similar, and are given opportunities to express their feelings and share memories. At Good Grief and Heads 'N Tales, we know that a supportive community makes all the difference! Liam organized a CrossFit Workout of the Day (WOD) at Guerrilla Fitness in Morristown, NJ that served as a fundraiser for Good Grief. The WOD was a partner workout, "I go, you go," for as many rounds as possible in 20 minutes : 7 Thrusters, 7 burpees and 7 box jumps. The significance of the rep scheme was inspired by the statistic that 1 and 7 kids will experience the loss of a Mom, Dad or sibling before the age of 20. Members of Guerrilla Fitness (Morristown) and athletes from nearby gyms raised close to $2000 for the event. Liam and I sat down for an interview after he completed this strenuous workout. Liam was a colligate Track & Field athlete at Rutgers University so we talked about his transition to life after sports. For many athletes the end of a sports career can feel like the loss of a close family member or friend. Liam and I talk about ways to cope with this loss based on Good Grief's philosophy. During our conversation Liam said "now is the envy of all the dead". I felt that this was a great message for athletes transitioning to life after their sport or recovering from an injury because it could always be worse. We also talked about the importance of practicing gratitude as a tactic to improve happiness. In addition, Liam shares tales about a couple of concussions he suffered while playing sports in high school. Want to learn more about Good Grief?